Ringstead southern postmill was the stood adjacent the northern postmill a few yards away. Both mills were under the same management and ownership. They stood at the end of a track some ¾ mile north of the village along with a cottage and outbuildings. 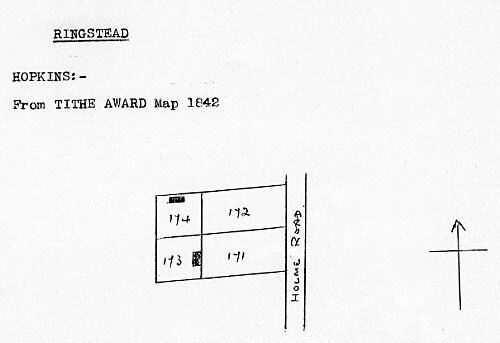 Both Faden's and Greenwood's maps show two adjacent postmills at Ringstead, the northern mill and the southern mill, the latter was advertised for sale and removal before Henry L'Strange Styleman le Strange built a towermill on the same site c.1840. It was reputed that the southern postmill was moved about 2 miles east to Beacon Hill in Thornham, although up until 1863 the Rate Book in Thornham only records John Crane as owning one mill in Staithe Road even though both mills were known to be there in that year, thus the Ringstead southern postmill may have been assembled there during the course of that year, becoming Thornham_composite_mill. The mill used 2 pairs of 4 ft. French burr stones, a flour mill and a cylinder. A horse mill was also operated on the site and by 1830 a bake office was also being run that was capable of producing 30 stones of bread. Unless sooner disposed of by private contract of which notice will be give in this Paper. A Capital and very Valuable ESTATE situate at RINGSTEAD in the county of Norfolk, consisting of two excellent Post Windmills with three pair of French Stones, large Granaries, Horse Flour Mills, Meal and Flour Chambers and Binns and a Capital Dwelling house with barn, stables and more than 40 acres of Land in high condition with every convenience for a Farm and carrying on the Meal and Flour Business on an extensive scale. The premises are admirably situated for trade and the buildings are in most excellent repair. The above Estate is all Freehold except about 4 acres and a half which are Copyhold, fine certain - pays a small quit rent - is moderately assessed to the Land Tax and subject to no outgoings. Immediate possession may be had. Apply to Mr. Williams, Attorney at Law, Thornage near Holt, Norfolk. 12 Aug. 1801. Matthew Green & Samuel Herring of Ringstead, Co. of Norfolk, Millers. On two Post Corn Windmill houses timber built, situate in a Field in the parish of Ringstead aforesaid, in their own occupation not exceeding £150 on each £300. Standing and going geers, millstones, machines etc. therein £100. Stock in trade and utensils £100. Not exceeding £50 on each for the standing and going geer etc. and £50 each on stock in trade and utensils. Warranted no steam engine in either. Cylinder and Flour Mill, capable of manufacturing Four Last a Week on the average: also a Baking Office, convenient Dwelling House, Granary, Stables, necessary Outbuildings, good Gardens and about an acre and a half of excellent Arable Land adjoining the Premises. Apply to Mr. Robert Herring, the Proprietor, on the Premises. Lot 1. All that excellent POST WINDMILL with two pairs of 4 ft. French Stones, nearly new, lying abreast, Flour Mill and Cylinder and also all that convenient Dwelling house and Baking Office attached with Oven capable of baking 30 stones and also Granary, Flour houses Stables, Piggeries and requisite Outbuildings, all in good repair and two gardens well planted with choice fruit trees, which with the Yard and Site of the buildings contains nearly an acre of land. This Lot is Freehold and is now in the occupation of Mr. Robert Herring, the Proprietor, who will give up possession at Michaelmas next. Lot 2. All those six Acres of rich Arable Land in one piece surrounded with good fences and in a high state of cultivation, lying within about 200 yards of the first Lot. This Lot is part Freehold and part Copyhold of the Manor of Ringstead with Holme on the part of Ringstead. Apply to Mr. Goodwin, Solr. Lynn. To be Sold by Auction on 3 June, 1834, at the Duke's Head in King's Lynn, Norfolk. The following property situate in Great Ringstead in the County of Norfolk. Lot 1. All that excellent Post Windmill, with two pairs of 4ft. French stones, nearly new, lying abreast, Flour mill and cylinder; and also that convenient dwelling house and Baking Office attached, with Oven capable of baking 30 stones, and also granary, Flour Houses, stables, outbuildings etc. all in good repair. This lot is freehold and is now in the occupation of Mr. Robert Herring the Proprietor, who will give possession at Michaelmas next. To be Peremptorily SOLD by AUCTION by Geo. Silcock at the Compasses Inn in Ringstead, in the county of Norfolk, on Friday 20 May, 1836. Lot 1. All that excellent POST WINDMILL, with two pairs of 4ft. French stones nearly new lying abreast, Flour mill and Cylinder and also all that convenient Dwelling House and Baking Office attached with oven capable of baking 30 stone and also granary, flour house, stable, piggeries and requisite outbuildings all in good repair and two Gardens well planted with choice fruit trees, which with the yards and the site of the buildings contain nearly an Acre of Land. All the above Premises are Freehold and are now in the occupation of Mr. Robert Herring, the Proprietor, who will give possession at Michaelmas next. Lot 2. Six acres of rich Arable Land ... within about 200 yards of the Mill and Dwelling house. Apply to Mr. Robert Herring, Mr. Silcock, Auctioneer, Heacham or to Mr. Charles Goodwin, Solr. Lynn. To be Peremptorily Sold by Auction at the Compasses Inn, in Ringstead, in the county of Norfolk, on 20 May, 1836. All that excellent Post Windmill, with two pairs of 4ft. French stones, nearly new, lying abreast, Flour mill and Cylinder. Also convenient dwelling house and Baking Office attached with oven capable of baking 30 stone. The above premises are freehold and are now in the occupation of Mr. Robert Herring the Proprietor, who will give possession at Michaelmas next. A Capital POST WINDMILL running two pairs of Stones with Flour Mill and Machinery complete, Dwelling house, Bake office, Stables and convenient Outbuildings and 6 acres of superior Arable Land capitally situated for Trade and all in good repair. A Capital POST WINDMILL 22 ft. long by 12 ft. wide with length of sails 8½ yards, driving two pairs of 4 ft. French Stones, flour mill, cylinder for offal, flour bins, capable of holding from 40 to 50 sacks, stone nuts on cast iron spindles, two pairs of regulators and sack tackle with double motion. Apply to Mr. Charles Goodwin, Solr. Lynn. This mill or the northern mill was removed and taken to Beacon Hill Road in the adjacent village of Thornham in the latter half of the 1800s before being re-erected as Thornham composite mill. One of the mills was removed to Thornham, by the road leading to the granaries, where it now (1930) is. The site was purchased by Henry L'Estrange Styleman Le Strange who erected the present mill.